Application for adoption is underway! "Thank you" seems to say so little sometimes, and now is one of those times. Just to let you know, don't ever think there are other things you should be doing to make your guests' trips better... it is impossible! Really and truly I couldn't have dreamed it better, way beyond my expectations! 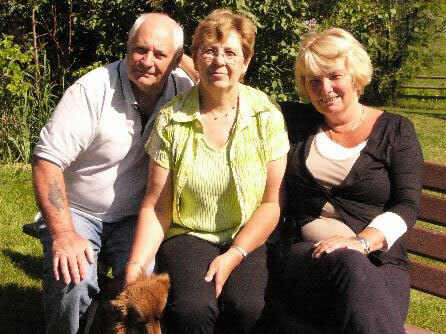 I was trying to think about the highlights and it always came back to you three and your family. I arrived feeling like a guest and left feeling like family as well. It is a treat to be with people who are just simply themselves. Heaven doesn't get better than what you've got right there on your ranch... breathtaking from every view! You haven't seen the last of me! I will be back for sure!!! Did I mention my nickname is "Velcro" I stick to everything and I'm hard to get rid off! You are all as welcome as the flowers in May to come visit PEI anytime, my door is always open and I have an extra room and would love the company! The bears in the meadows, the eagle in flight. The dogs in the puddles, wild floweres in the sun. The food on the table - what a wonderful sight. We will save some more money to return next year. Our six English ladies spent a week with us & kept us totally entertained. Maria from the Netherlands found one of our few hot days to play with the dogs in the creek. Alex was totally smitten with Canadian Ranch life, is already looking at buying a western saddle for her horse and has been practicing barrel racing. Alex would love to return to stay with you; she is just trying to raise the funds to return. Thank you again to you all for giving us such a warm welcome. I now have a cowgirl daughter who contantly plays country and western music and talks with a Canadian accent!! The hills around Lucasia Ranch are very green this spring, due to a great extent, to the spring rain and late snow we've had. We're enjoying some of the first guests of the season, including Carol and Steve from the UK who announced their engagement the day before they left the ranch! We would like to send our congratulations to them! I've just about recovered from jetlag now and have realised that I have just had the best holiday of my entire life. You all made us so welcome and everything was just perfect. The scenery was stunning, the horses so well behaved and responsive, the food was fabulous (I'm now on a diet needless to say) the log cabin perfect for the 2 of us. What more can I say? Thank you so much for making it so enjoyable! I hope your back and ribs aren't too painful Wayne and that you've got some nice guests with you this week. I hope to see you again next year. I have just returned from a 'dream come true'. Since the early 1950s I have yearned to sit on a quarter horse overlooking a herd of cattle on pasture that stretches on for ever. 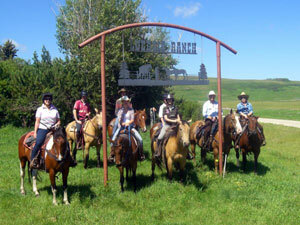 For anyone who wants to be a cowboy/girl for a week or two, the Lucasia Ranch, near Claresholm, Alberta is the place to do it. 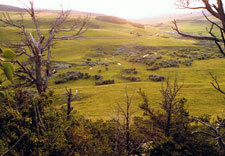 The four thousand acre ranch of rolling green hills and woods is situated in the Porcupine Hills. The views are breathtaking. 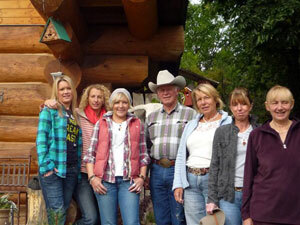 The working ranch is run by Judy & Wayne Lucas who welcome you to their dining table with fabulous local dishes and entertaining conversation. If any of their three sons join the table, the talk will be dominated by horses, cattle and rodeos. Guests are accommodated either in a superb log cabin, a very comfortable bunkhouse, (where I stayed) with a short walk to the shower or two rooms in the main ranch house. 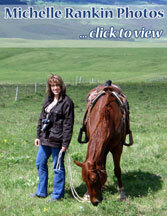 I spent every available minute in the saddle, either trail riding or moving cattle to new pasture. With the help of neighbouring ranchers and the sons we moved yearlings to their summer grazing on a days drive. There is plenty of wildlife in the area. I saw two black bears, moose, white tailed deer, golden eagles, red tailed hawks and a bald eagle, plus a variety of smaller birds and flora. After dinner one evening we walked the twenty five minutes to an eyrie and gazed at a fledgling golden eagle watching the sun go down. On the occasions we didn't ride Judy took us out to local attractions: a rodeo show, the World Heritage Site 'Head-Smashed-In Buffalo Jump', Fort MacLeod (where the 'Mounties' were formed) and shopping. I had a truly memorable time and highly recommend it for a visit. Hi Judy and Wayne and Laura and Claudia and the boys and all of those fabulous pets of yours.I've just about recovered from jetlag now and have realised that I have just had the best holiday of my entire life. You all made us so welcome and everything was just perfect. The scenery was stunning, the horses so well behaved and responsive, the food was fabulous (I'm now on a diet needless to say) the log cabin perfect for the 2 of us. What more can I say? Thank you so much for making it so enjoyable! I hope your back and ribs aren't too painful Wayne and that you've got some nice guests with you this week. I hope to see you again next year. Your hospitality is beyond compare. I had such a great time and just felt right at home from day one! This has been a dream come true and to share it with my sisters made it even better. I will always look back at this being one of the best experiences of my life! Words cannot express what these last six days have done for me. Leaving my cell phone in the cabin "finally" and letting other people's problems be their own. Giving back myself to the important people in my life. You have such a blessed life, wonderful children, good friends. May your life always be blessed. I hope to see you in the future. This place and you all will hold a special place in my heart. We headed west, it was the fall, a cattle drive, we had a ball. Upon a horse we had such fun, no need for sea or surf or sun. It was the best vacation yet. Would we go back? You sure can bet. With Lyle and Heather at our side, we rode along with Brett, our guide. Each day we saddled before the dawn and after breakfast, we were gone. We rode up in the hills so high, they reached right up into the sky. It was so awesome at the top, the hills just seemed to never stop. The Rocky Mountains, in all their splendor, seemed to be just over yonder. Much colder there, than here, I know. If in his wisdom, God had planned, for us to visit this great land. Upon a horse I’d want to be, instead of on a boat at sea. 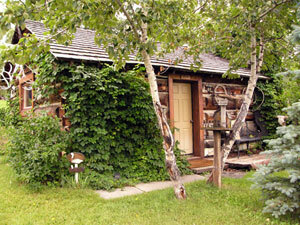 Be sure to visit Wayne and Judy, amongst the hills in all their beauty. Ginny wrote this lovely poem and was always pitching in as was Mick who helped build my new extra long dinning table.